As promised, a different sort of posting here: legal and historical background that is essential to understanding Jewish rights in the land. This review will be succinct, with links to informational sites for those who wish to know more. It is important to save and share this material, as it provides data critical for properly defending Israel. Emphasis has been added to certain key phrases. As always, I welcome serious questions. Jewish legal rights in the land in modern times began with the San Remo Conference and resultant San Remo resolution, which has been called the Jewish Magna Carta. For centuries, Palestine had been part of the (Turkish, Muslim) Ottoman Empire. With the end of WWI, the land of that Empire was taken by the Allies. Great Britain, France, Italy and Japan, with the US as observer, met in San Remo, Italy, to decide how it would be divided: Palestine was put under British Mandatory rule. In July 1922, the League of Nations, predecessor to the UN, formally adopted the British Mandate for Palestine — a legally binding document that was approved by all 51 members of the League of Nations. The term “reconstituting” gave acknowledgement to the fact that there had been a Jewish nation in Palestine at an earlier time. The mandatory system of the League of Nations was based on the principle of Allied administration of Mandate territories until such time as they were able to stand alone. That is, it was understood at the beginning that the British would ultimately withdraw, leaving an established Jewish homeland. 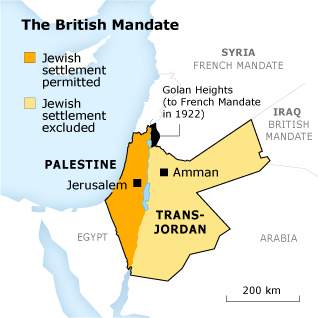 The original area of Palestine, for which the British Mandate was assigned, included Transjordan (what is today Jordan, on the eastern side of the Jordan River). In September 1922, very soon after the League of Nations had adopted the Mandate resolution, Britain assigned TransJordan to Hashemite Arabs from Saudi Arabia. The Jewish part of the Mandate was thus reduced by over 70%. Jews then had the right to settle anywhere in a 10,000 sq.mi. area between the Jordan River and the Mediterranean Sea. With the formal demise of the League of Nations in 1946, the United Nations was established to succeed it. The UN assumed obligations of the League: Territories under Mandate were to have a “trusteeship system” applied — this was a continuation of the Mandate system of the League. Article 80 of the UN declared that “nothing in the [UN] Charter shall be construed…to alter in any manner the rights whatsoever of any states or peoples or the terms of existing international instruments.” This preserved the Jewish right to settle in Palestine. From the time of the establishment of the Mandate for Palestine, Arab challenges to it were considerable, and were often expressed violently. This was in spite of the fact at that the same that the Mandate for Palestine was established for the Jewish homeland, Mandates for Syria, Lebanon and Iraq were established, all for Arab populations. Arabs were, and still are, offended by the presence of a Jewish state. It is imperative to note that General Assembly Resolutions carry no weight in international law. This resolution was only a recommendation — it was not binding and it did not supersede the Mandate for Palestine in international law. There is no way for Arabs today to re-instate this resolution or to claim that Jews have a right to only what was defined as a Jewish state by this aborted resolution. On May 14, 1948 (Hebrew date: 5th of Iyar 5708), the Jewish People’s Council gathered at the Tel Aviv Museum, and approved a proclamation, declaring the establishment of the State of Israel. It is important to note that Israel’s legal legitimacy did not derive from the aborted partition plan — even though the state was founded on that portion of Palestine that Resolution 181 had allocated for a Jewish state. It was established according to international norms: based on a declaration of independence by its people and on the establishment of an orderly government within territory under its stable control. 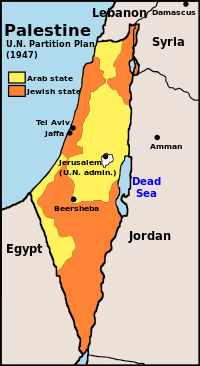 The portion of Palestine on which Israel was not established became unclaimed Mandate land. Nothing in international law had superseded the status of this land as Mandate land. Within a day of the establishment of the State of Israel, it was attacked by the states of the Arab League, with clear, openly stated, intention of destroying the new state. When the war ended in 1949, Israel controlled more territory than it had when independence was declared. Egypt controlled Gaza, and Jordan controlled Judea and Samaria (the West Bank). Western Jerusalem was in Israel’s hands, and eastern Jerusalem in Jordan’s hands. Armistice agreements were signed between Israel and the Arab states with which it had been at war. Armistice lines — temporary ceasefire lines — were defined by these agreements. They are often referred to as the Green Line. This is exceedingly important because the PLO/PA claims that this line is Israel’s “real” border and the line to which it must withdraw. This is simply not the case. From June 5 to June 10, 1967, Israel fought a defensive war against Arab forces from Egypt, Syria and Jordan. When it was over, Israel had control of all of Jerusalem, which was united under Israeli sovereignty; the Golan Heights, to which Israeli civil law was applied; the Sinai, which was surrendered as part of the 1979 peace treaty with Egypt; Gaza, which was surrendered in the 2005 disengagement; and Judea and Samaria. In November 1967, the Security Council adopted Resolution 242, which addressed the situation. Thus this resolution called for Israel to withdraw from “territories occupied in the recent conflict.” “Territories,” not “the territories” or “all territories,” meaning, withdrawal from some but not all of the area of Judea and Samaria. There is a legal history of long debate over this wording, because of its significance. Not full withdrawal because that would not leave Israel with a secure boundary. Once again, then, we see that the claim of the PLO/PA that Israel “must” withdraw to the Green Line is not supported by the facts. Lastly, the resolution called for “a peaceful and accepted settlement in accordance with the provisions and principles in this resolution.” That is, it called for negotiations to determine the final border of Israel. There was no requirement that Israel withdraw prior to negotiations. And those negotiations have never been held. At the time of this resolution, it was assumed that negotiations would be with Jordan. Today the situation has changed. Israel is not an “occupier” in Judea and Samaria. The word “occupation” is bandied about regularly. The PA/PLO have adopted the idea of Israel as “occupier” as a mantra and much of the world has accepted it. But the facts tell us something else. Judea and Samaria were (and still are) unclaimed Mandate land, to which Israel has the strongest claim. Legally, occupation only occurs when one nation moves into the land of another. But there was no nation legally sovereign in Judea and Samaria before 1967 — Jordan’s presence there was not legal. There are strong legal precedents for the claim that a war fought defensively permits retention of the land secured in that war. “…the Israeli conquest of Arab and Arab-held territory was defensive rather than aggressive conquest. 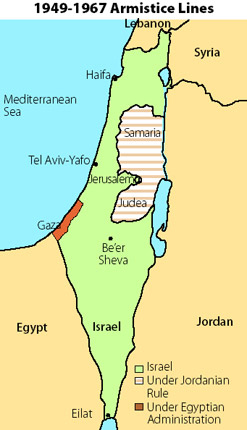 With all of the above, it should not be forgotten that areas over the Green Line, in eastern Jerusalem and Judea and Samaria, represent the very heart of Jewish heritage: From the Temple Mount; to Hevron and the Cave of Machpelah, where the matriarch and patriarchs are buried; to Shilo, where the Tabernacle was brought. How can Jews be “occupiers” in their own ancient land? People have the impression that “international law” is a firmly defined body of law. In point of fact, while some international law is established in formal documents, others aspects are very fluid. Just as is the case with “occupation,” there is a tendency to politicize this term, so that Israel is forever accused of “violating international law.” Be most cautious when hearing this. There are, as well, instances in which “international law” is interpreted to mean one thing for Israel and another for other countries. There are two obvious retorts to this: First, that Israel is not an occupier, and second, that Israel is not deporting or transferring parts of its own civilian population — the people go of their own volition. Eugene Kontorovich, however, is currently doing research for a paper and has discovered something else: There are many instances of movement of civilian population into occupied territory. However, while international lawyers claim that Israel must actively oppose civilian migration, refuse to provide services to settlers, etc., in these other instances the reaction is much more tempered. That is, the presumed requirements of “international law” are applied selectively to Israel. The Oslo Accords, promoted originally by Shimon Peres, Yossi Beilin and others, was founded on the assumption, which proved to be seriously and dangerously erroneous, that peace might be achieved between Israel and the PLO, considered the official representative of the Palestinian Arab people. On September 13, 1993, the Declaration of Principles was signed between Israeli Prime Minister Yitzhak Rabin and Yasser Arafat, Chairman of the PLO. The PLO never properly ratified these Accords, although there was pretense of having done so. Even more significantly, the PLO was committed to changing clauses in its Charter that call for Israel’s destruction. Again, there was pretense — a committee to effect the changes was formed — but it never happened. The PLO Charter of 1968, which calls for Israel’s destruction, is still in place. On May 4, 1994, the first agreement was signed, spelling out a limited pullback of Israeli forces in Gaza and Jericho, with the PLO moving into those areas. At this time the Palestinian Authority was founded as an interim administrative authority for a period of five years. On September 28, 1995, the Interim Agreement (called Oslo II) was signed. This called for a more extensive pullback from major Arab population centers, with the PA assuming responsibility. Three areas were defined: (A) in which the PA has total control, (B) in which the PA has civil control and Israel retains responsibility for security, and (C), in which Israel has total control. All Jewish settlements in Judea and Samaria are in Area (C). There is nothing in this Interim Agreement that prohibits or restricts the establishment or expansion of Jewish communities in that area. According to Oslo agreements, so called “final status issues” must be resolved via negotiations: Borders of Israel, potential division of Jerusalem, the nature of the Palestinian Arab entity, etc. Unilateral actions that achieve a change in the basic situation are said to be a violation of the Accords, which require negotiations. PLEASE NOTE: The Oslo Accords do not specifically call for the formation of a full Palestinian State, although that is the working assumption today. The goal, as stated in the Declaration of Principles is “negotiations…leading to a permanent settlement based on Security Council resolutions 242…” (From 1967, discussed above.) These were supposed to be the negotiations that would finally determine Israel’s border to the east. Until his death, PM Yitzhak Rabin spoke of an autonomy for the Palestinian Arabs that was short of full statehood. With these negotiations was to come peace. Put simply, this is a Muslim propensity for falsehoods or deception in certain circumstances. This behavior is not only approved but sometimes mandated by Sharia (Islamic) law if it benefits Islam or protects Muslims. The fact that Palestinian Arabs practice taqiyya — which Islamic scholar Raymond Ibrihim says is mainstream in Islam, and…very prevalent in Islamic politics — makes it more difficult for Israel to make its case. Palestinian Arabs, for example, claim that they are the indigenous population in Palestine, descended from the Canaanites or other ancient peoples, while the Jews have no history in the land. The reality is that those who today call themselves “Palestinians,” until a few decades ago identified simply as part of the Arab nation. In fact, before the founding of the modern state of Israel, it was the Jews who were referred to as Palestinians, not the Arabs. Similarly, Palestinian Arabs say that the Jews are on “their” land and must give it back. The reality is that there has never been a Palestinian state, on this land or anywhere. There is no case to be made for calling it “their” land. The reality is that the PLO (Palestinian Liberation Organization) was founded in 1964, before Israel had secured Judea, Samaria and Gaza. What the PLO wanted to “liberate” was Israel inside the Green Line. Michelle Malkin: The ABC’s of Education Now Are… “A” For Agitation, “B” For Brainwashing, and “C” For Capitalism-Bashing! Obama Bypassing Congress on Guns?